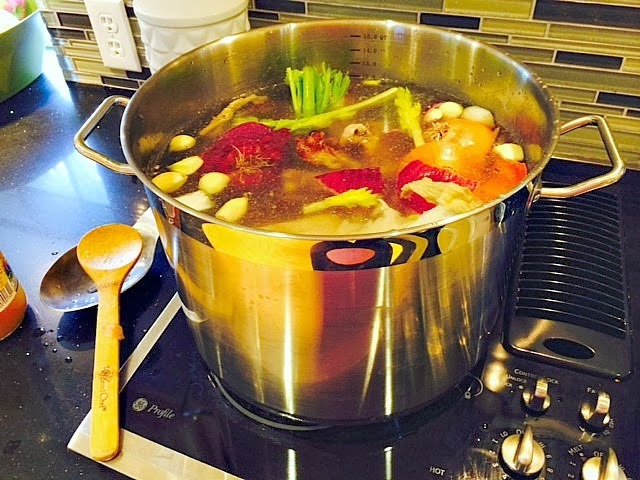 Chicken stock in my new stockpot, Betsy! We go through a lot of stock in our house. I use it to make rice, soup bases, pasta, and well, just about anything that calls for water. I like to drink it with fresh parsley and a few fresh garlic cloves pressed into it (and a bit of salt). My new stock pot is a 16 quart, so I am delighted that I can get 3 sets of chicken bones into it. I save all the trimming from veggies when I'm cooking. I throw them into one big gallon bag in the freezer until I'm ready for them. Also, I only make stock from pastured chickens. You gotta think about what those chickens have in their systems and marrow. 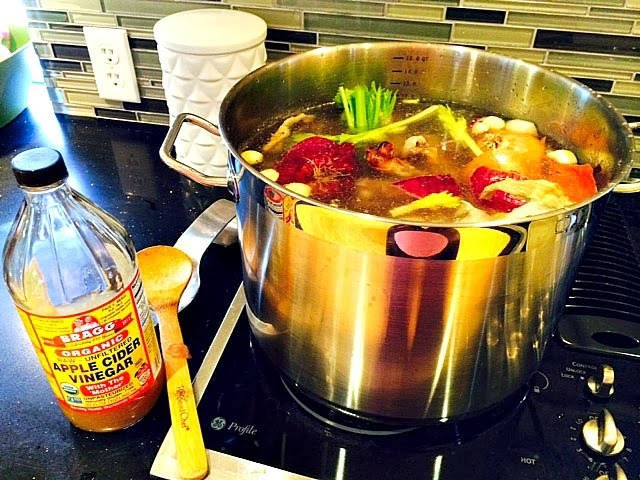 Do you want that in your broth? I order from Yonder Way Farm which has a drop once a month in my area. They sell pastured chicken, beef, pork, and eggs. They also swing by Stryk Dairy during the delivery rounds which sells raw milk and dairy products. Yonder Way also sells chicken feet. This kind of eeks people out sometimes, and honestly when I first started it did me too. The farm has started cleaning and clipping them before selling, so that makes it A LOT easier. Anyway, I throw in 2-3 chicken feet to add to the richness. 10. Add garlic and parsley during the last hour. I forgot last time and threw my garlic in at the beginning. This last batch of bones I ended up using again. I just removed all the used up veggies and placed the bones back in the pot. I didn't have quite as many veggies in the stock the second time around, but it's still great for soaking and cooking! Lovely to discover your blog, via Sarah. I always make chicken stock too, it is so good and much better than the stock you buy.